By Roland Ford Palmer, S.S.J.E. Bracebridge, Ontario: Art Department of the Society of St. John the Evangelist, 1943. THE present century has been notable for the efforts that Christian People have made to bring about external unity among themselves. The motives have been fairly clear. There was a desire to fulfill our Lord’s will that all be one, and a strong desire to present a united front to those mighty forces of evil in the world that oppose all Christianity of whatever name. Mixed up with the purer motive of serving better the Kingdom of God, there were less worthy motives, such as a desire to save expense, a desire to have all those that we mix with socially in the same religious body with ourselves, the desire to have more political influence because of greater numbers, the natural desire not to be peculiar or different from the majority, but to act in the mass. There is a very strong reason for desiring unity among Christians at the present time. Due to the rapid expansion of the population and its ability with modern inventions to move about freely, the old local communities have been broken up. Man needs the restoration of community. In Russia a large and successful effort has been made to restore community, but on a godless basis. Christianity alone can provide the true motive for unselfish sharing with one another and helping one another. The chief evil of our unhappy divisions is that Religion, which ought to be the very force to bind us together in local communities, is in many places the very thing that divides us. On week-days our children all go to the Public School and for five days out of seven represent a real community, and when the Lord’s Day comes they separate. Fifty per cent go nowhere, and the other fifty per cent scatter to the religious exercises of the Roman, Anglican, United, Presbyterian and Baptist Churches. Christianity, which ought to unite them all by drawing them all together in worship of the Heavenly Father, gives them the spectacle of outward division. Religion ought to be the whole of life. To a divided Christianity it seems to be a little section of life only, confined especially to one day, and a few short hours of that day. Religion does not enter much into school life, or farm or factory or commercial life, and so it enters less and less into home life. It becomes an extra for such as like it. If we Christians were all one we should be able to give definite religious instruction in the schools. Religion would be seen to be as important as, and more important than, geography and arithmetic. We could enter into factory, farm and commercial life. A new factory could be dedicated and the crops blessed at rogation time, the opening of a new year in a commercial concern recognized by prayer and worship. Members of trade unions could have their special days of worship and their chapels in the Parish Church, and so we could show that all our life is religious and that our daily work is an acceptable offering to God, Employer and employee could all work in that spirit, and see each other’s point of view. Disputes could be settled in a Christian spirit if all worshipped before the same Altar. Secular and religious could merge. Both body and soul could be seen to be dear to God. Work would appear a blessing and not a curse. In the country our unhappy divisions are most manifest, for it is there that community is most needed. In the country it could most easily be restored. Look at the unhappy spectacle of three little churches at one crossroads hamlet. On a Sunday a few trickle into the United Church, a few into the Anglican Church, and a few more into the Baptist. A few miles down each road is a schoolhouse and a little local community, where there is no house of God, and where many of the people seldom go to Church, except for a funeral. We do need outward unity very badly indeed. While we see this need, let us not forget the underlying and inward unity that does already exist. The divisions are for the most part near the surface. Some are merely surface cracks. We are nearly all united in our belief in One God, Father, Son and Holy Ghost. We do believe in Jesus Christ as our only Saviour, and that He is perfect God and perfect Man, who was born and lived and suffered and died and rose again for our Salvation. We do accept the sacred Scriptures of the Old and New Testaments as being the canon or rule by which Christian doctrine and life are to be measured to see if they come up to the original standard of Christianity. That is a great deal to have in common. Most of us have also the Sacrament of Baptism as an outward bond. We begin to differ when we try to explain what Baptism means to us. We differ even more when we come to the other great Sacrament of Holy Communion. We differ over the purpose and form of public worship. We differ most of all over our conceptions of the functions and forms of the Ministry. We agree in much of our teaching about the Christian way of life. We differ in our teaching about marriage. We differ in our attitude to Sunday observance, the use of amusements and such luxuries as tobacco and certain beverages. In some well meaning schemes of reunion that are before us at the present time, there seems to be an effort to gloss over these differences on the ground that some of them are just on the surface and do: not go very deep. It is taken for granted that others, that really do go deep, are of little importance. An effort is made to find a form of words that all parties can accept, even if it is well known that each accepts it outwardly, but puts his own meaning into it. Each hopes the other will come round to his way of thinking. It would seem far more honest, and more likely to bring about reunion of a permanent character, if instead of glossing over our differences we tried to explain to those who differ from us what real religious values these differences have for us. We have hesitated to do this lest we stir up more trouble. We have covered over the wounds without cleansing or healing them. It is quite evident from reading what non-Anglicans write about those points on which we differ from them, that they generally have a mistaken idea of why we treasure our peculiar beliefs and practices. That is partly because we have left it to people of controversial temperaments to write about those matters. These men put our differences in the most uncompromising words. They often use words that mean one thing in the strict interpretation put upon them by theologians, and1 quite another in the use made of them by ordinary lay folk. So we seem to them to be spiritually snobbish, to be supporting an autocratic form of church government, to be hide-bound formalists, to think more of the outward form than of the inward grace, to be unready to see the Hand of God or the working of the Spirit outside certain channels. So eager have we been in some of our. negotiations with our fellow Christians to show that we are not narrow minded, and that we do not deny the grace of God wherever it is manifest, that we are not snobbish, that we have put ourselves in danger of bartering away very precious possessions—possessions that the very people we are negotiating with will one day value. Why should we not try to persuade them to value them now? Suppose that a hundred years ago we had tried to placate the old fashioned Presbyterians and Methodists of that day by giving up the Christian Year, the use of a liturgy, the placing of the Holy Table as the centre and focus of our church buildings, the use of our Church Music, the dignity of public worship. Should we have done them a kindness? Would the present day United Church have benefited? No, for they have come to value all these good things and to adopt them. Why should not the next few years find them ready to adopt sacramental worship and apostolic orders, and to give up a certain puritanical attitude to some matters? It is the purpose of this (paper to try to show the spiritual value of sacramental worship and of apostolic ministry for the Christian life, and the danger of puritanism. THE purpose for which Christians assemble together is the worship of God the Father through his Son Jesus Christ in the fellowship of the Holy Spirit. There will be a large element in that worship of proclaiming the Good News of the Gospel, but that will be a means to an end and not an end in itself. Primarily we go to God’s House not to gets but to give. We go to empty ourselves out in humble worship, and then to be filled with heavenly grace. Unfortunately in Protestant Christendom public worship has for generations been conducted in such a manner that the preaching of the Good News, essential as it is, has been made the climax and the main purpose of assembly. The worship of God has taken second place, sometimes disappearing except as an incident in a verse or two of a hymn, or in a prayer. Even the prayers contained far too little of the element of worship and thanksgiving, and were in some cases faintly veiled exhortations to the people. The hymns tended to be more and more of a subjective, individualistic and sentimental character, and to contain very little of the worship of God. That state of affairs has been largely corrected by the improved hymnals and books of worship now in use, but the people are still very far from understanding the main purpose for which they come together. The common excuses for not going to Church show us how deeply rooted is this wrong idea. “I don’t go to — Church any more. I don’t seem to get any good there.” “I can get more good by staying at home and listening to the radio service.” ‘Suppose that you went to see your poor old mother only for what she gave you. Suppose that after she got too old to cook good meals you stopped going. We treat God very rudely if we go to Church only for what we can get. We should go to give, not to get. We go to give ourselves, soul and body, all that we are and have; all the work that we have done, and the life that we have lived. We take it all to Him and lay it down in humble worship before His Throne. So the whole of life becomes religious. Worship and work, daily life and churchgoing are all of a piece. Worship is relevant to daily life. The Anglican Communion has itself been infected with the subjective type of worship. Instead of carrying out the provisions of the Prayer Book we have reduced the worshipful elements to a minimum and centred our churchgoing in the pulpit rather than the Holy Table. We have overlaid the classic simplicity of our services with much meaningless sentimentality—distant Amens by the choir, processions and recessions more splendid than the service itself, sentimental hymns and anthems. 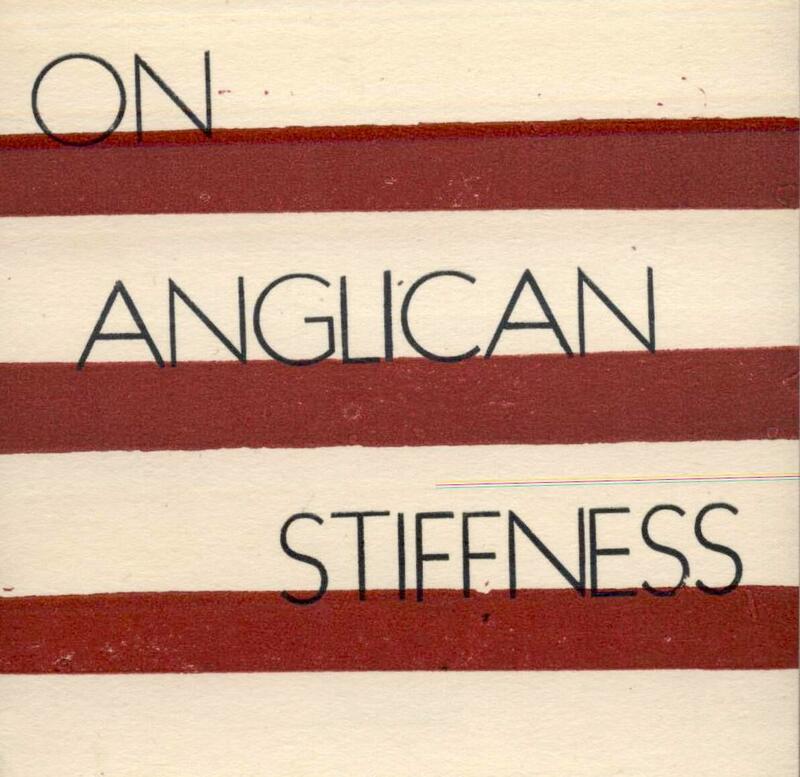 Anglicans must confess to being unfaithful to their own traditions. However, much as we have failed, we still have in our Liturgy and Church Order the better way, and we are coming back to it. I think that our friends in other Communions will appreciate why it is that we are so devoted to our Prayer Book. It is a safeguard of true Godward worship. As long as the Holy Table keeps its position as the central feature of our churches and the Prayer Book is in use in the pews, we shall never drift hopelessly far from the true ideals of Christian worship. The Prayer Book provides for Holy Communion as the climax of our worship on all Sundays and Holy Days. Other services such as Morning Prayer and Litany lead up to this great service, and Evening Prayer later in the day forms a suitable act of gratitude for the day’s worship. But far from providing for only one day in seven, the Prayer Book is a constant witness that all our time belongs to God. The ideal the Prayer Book holds up to us is that of daily worship in church, morning and evening. The pastor is told to have the bell rung twice a day and to go himself to the Church to lead in the offering of Morning and Evening Prayer to God with such of the people as are able to come. sang George Herbert, the model country parson. It is said that when the workers in the fields heard his church-bell ring every morning and evening, those who could not leave their work at least raised their hats, and joined with Mr. Herbert in prayer. No Anglican Church or any other church ought to stand shut and locked six days in seven. What a dreadful parable of religion divorced from everyday life is a locked church! Such a worship with its use of earthly elements of Bread and Wine, the fruit of man’s labours sanctifies our daily life, and presents it all as an offering to the Father. Some farmer grew the wheat, a miller made the flour. It is baked into Bread. The same is true of the wine. Think of all the machinery involved, and those who made the machinery, and those who mined the metals. Think of the means of transporting the elements here and merchandizing them. Think of the making of the flour bags and the bottles. Think of the women who prepared the food for the workers. Hardly any honest work in our land tout has gone into the making of this Bread and Wine for the Holy Feast. I am sure that you can see why we value this sacramental and sacrificial worship: not only because of the great benefit we receive from worthy communion, but also as the means of lifting up our hearts and lives to God. “Lift up your hearts” says the priest. We might as well ask “How?” “Let us give thanks” he replies. Thanksgiving is the characteristic Christian form of prayer. “And when he had given thanks he brake it.” The Eucharist means the Thanksgiving. Our daily lives are the Wave Offering. The Eucharist is the Heave Offering. We dare not offer ourselves as we are. We are poor sinners. In the Eucharist we can wrap ourselves up in the white tissue of Jesus’ merits, and plead his Precious Death; we can tie ourselves round with the scarlet ribbon of the Precious Blood shed for us, and so we become a present for the Father, “Accepted in the Beloved” Son. Perhaps you see now why we cling to the old word priest as the name of the minister of this sacrament. It is a reminder to us of the priestly character of the whole Body of Christ. “Ye are an holy priesthood, to offer up spiritual sacrifices, acceptable to God by Jesus Christ,” (i Pet. ii:5.) The whole Body is priestly, for it is the Body of Christ, the one true Priest. All the members are priestly because they belong to that priestly Body. Some members are called and ordained in the Body to be the special ministers of that priestly Body. They have a ministerial priesthood, not apart from their brethren of the laity, but in communion with them, and on their behalf. In a democracy all men are rulers, yet some are specially appointed to exercise that rule on behalf of the rest, and they are commonly called our rulers or governors. In calling them so we do not deny our own privilege or duty, but rather we assert it. It is true we do not ourselves call some members to this priestly activity on our behalf, God does the calling. This ministry is from above, not from below. Our illustration however shows how there can be differences of administration but the same spirit. The use of the word priest is valuable as a constant reminder of the sacrificial nature of the life and worship of Christian people. It is also a reminder that as there are ministerial priests, so there are carpenter priests and clerk priests, student priests and household priests, farmer priests and labour priests. Every man is a priest of his own craft offering up his work on behalf of the whole community to the Father. Every member of the Church shares in the priestly activity of Christ. The ideal is that as many as possible should take part in the services. The Bishop or priest utters the thanksgiving and breaks the bread. The Deacon reads the Gospel. Others read the Epistle, lead the singing, and bring up the offering of money and bread and wine. Everyone should be active in this worship of Thanksgiving, kneeling and standing and moving about. Ours is not a passive worship where people sit facing a minister and a choir who shed forth over these passive souls and bodies sermons and anthems. It is to make clear that we are looking away from ourselves to God that the minister often faces away from the people altogether. We are the children of God, with Jesus in our midst, coming gladly to our Father who is in Heaven. We need a sacramental worship to bind heaven and earth together. We need to have all earthly good things sanctified by the giving of thanks over them, The sacraments have the common touch. They lay hold of the things of our daily life and lift them up to God, and us along with them. Jesus the great optimist taught us to pray “thy will be done on earth as it is in heaven.” He believed that the Kingdom of God does come on earth. Earthly things must then be sanctified for his use and made wholesome and safe for our use. The Anglican Communion has plenty of sins to confess. She has not lived up to her high calling. She has neglected some things that our friends of other communions have kept more faithfully. She has not been careful enough about her pulpit ministry, nor has she been keen enough on evangelism. Anglicans are well aware of these faults and are striving to overcome them. We have neglected our Altar ministry and our daily services. Why do we hold on to our peculiar ways of worship? Not just out of pigheadedness, or as thinking ourselves perfect and others inferior. We do it because we see in our Prayer Book an ideal to which we have never yet attained, but towards which we strive; and an ideal that we believe our brethren of other communions would value and set before themselves if they once saw it. There was a day when some protestants would not use a hymn book. Now most of them will at least use a hymn book in order that they may be able to sing in common, and have orderly praises in place of every man singing his own composition. Now we see the prejudice against a Prayer Book vanishing. Some common form is needed in order that all may pray and praise in common, and not have to depend on the minister, or a few gifted laymen. We all desire to avoid being priest-ridden. The Prayer Book is a great bulwark against that evil. The minister is not left to his own devices as to what he prays about, nor even what scriptures he reads to the people. The whole Bible is portioned out to the different days in such a way that the whole glorious Gospel is unfolded before the people year by year and week by week. An Anglican minister cannot inflict on the people some pet hobby of his own. The Church Year with its regular commemoration of all the great events of our redemption prevents that. The Prayer Book is the Bible arranged for the public worship of God. THE great thing about the Christian Religion is its liveliness. “The gift of God is eternal life through Jesus Christ our Lord.” Christianity is not something that we do. It is something that God has done; and that we receive as a gift by faith. Christianity is not founded on bright ideas, or new thoughts, or fine theories, or thrilling emotions. It is founded on facts. A fact is a thing done. Who did it? God did it. Our religion is from above, not from beneath. It has not come about by men building up a sort of tower of Babel made of clever thoughts about life and the world. It is not built on the shifting sands of our emotions, but on the solid rock of things done by God for us. God reached down. God came down. God revealed something. Men were searching, but could never have found God had he not revealed himself. The Gospel is Good News. News is the relation of facts. Pacts are good solid things. Once a thing is done it is done. This givenness this factualness of Christianity is its most precious quality. What are the facts? They are all recorded in the Bible. The great outstanding facts are summarized for us in the Creed. The Creed is the Bible put into a few words. God made the world and keeps it. The God who does this is one whom we can call Father. God visited and redeemed his people. He came into his own world and was born of a human Mother. He really lived and suffered and died for us. He rose from the dead. He went into Heaven. He gives his wonderful spirit to us to unite us to himself in his holy Church which is for everybody, of every race, age and temperament. He provides for us in this Church a sacramental fellowship. We experience the forgiveness of sins. He will raise us up after death and give us his own wonderful quality of life, eternal life. Those are facts. They are things done, or to be done, by God for us. To us the ministry is an apostolic or sent ministry. It is not from below, but, like everything else in our religion, it is from above. It is part of that givenness. Jesus did not leave his followers to organize themselves after his Ascension, choosing a President and other officers as though, it were a matter of indifference. He chose the officers before he ascended into Heaven. He left his Church with the essential organization. It would be wrong to look on the Church merely as an organization. Rather, it is like a living organism. It is like the body. The members of the body do not choose certain members to do the seeing, and others to do the hearing. The members are set in the body by him who made the body. The body is meant to see and to hear, but the only members who can see are the eyes, and the only members who can hear are the ears. If the eyes are destroyed, the ears cannot say “we will do the seeing.” So, we believe, it is in the Church. The Church is the Body of Christ. It is the Church’s business to preach the Gospel and minister the sacraments, and offer to the Father the Sacrifice of praise and thanksgiving. The whole body does it, but it does these things through specialized members set in their place by God himself. A man is not a minister of the Church because he feels himself called to preach Christ. He must he set in his office and authorized to perform his functions by those ministers in the Church whose work it is to do this. He must also receive power from on high and special grace to enable him to preach Christ and minister the sacraments. He will need, and the people will need, some pledge to assure them of this. Ordination by prayer and the laying on of hands of those who are in the apostolic ministry themselves is needed for this purpose. Without this, how can the people be sure, and how can the man himself in time of temptation and discouragement be sure, that he is indeed a minister of the New Testament? Our religion is founded on facts, not on feelings. I am not a minister because I feel called to be a minister. I am not saved because I feel saved. I am saved because Jesus saved me. I am not a member of Christ and a. part of his Body the Church because I feel so, but because I am baptized. I know for a fact that on a certain day I was actually baptized and placed in the arms of Jesus. That is something that was done for me. It depends on me whether or not I make any use of my baptism, but the fact of my baptism does not depend on me or my feelings in any way. It is a witness to the givenness of our holy religion. I am baptized. I am a baptized person. I am in the stream of God’s love and grace. I can at any moment open my mouth and drink of those living waters. That good solid fact of my baptism is a wonderful aid to my faith, my trust in God through Christ. So it is with ordination. I know for a fact that on a certain day the Bishop’s hands were laid on mv head, and the presbyters present joined with him, and I was ordained a priest in the Church of God. That is a fact that I can rest back upon. I know that grace was made available for me then. “Receive the Holy Ghost” said the Bishop. I am ordained. I can draw at all times upon that Spirit for all the functions and difficulties of my ministry. My faith is built not upon my own emotions or experiences, but upon Christ and what he has done personally and through his Church. Jesus left a little band to be his Body on earth, his Church. Of them he appointed and ordained a few to be the Apostles, “those sent,” the first ministers of that Church. As the Father sent him, so he sent them. As he sent them out, so they sent others. The little band has never died out. Some died. Others were brought in by baptism. You are a part of that very same little band. There is an actual and real identity. The present Church is not only like the original Church Jesus founded. It is that very same Church. It is the old concern. There has never been any break in the continuity. Just as Baptism secures’ the continuity of the whole Body, so apostolic ordination secures the continuity of the ministry in that Body. According to the Acts and the Epistles, how were ministers appointed in the apostolic Church? It was the Apostles or their delegates who handed on the ministry that they had received. As the Father sent Jesus, so he sent the Apostles. As Jesus sent the Apostles, so they sent their successors. In the historic churches, that has been the practice from their times to the present day. Why does it matter? It matters because it witnesses to the factual nature of Christianity. Ours is an objective religion founded on facts, things done. It is not a subjective religion founded on the feelings of the individual. It witnesses to the givenness of our religion It is from above, not from beneath. It’ is a pledge to the people to assure them that they belong to the Great Church, the Church of all Ages and all Lands. This old apostolic ministry is a link with the Great Church present, and the Great Church of the past, and a Ink also with those who will come after. In a tiny country church there may be two or three only gathered round the Lord’s table. But—“Fear not, little flock.” You belong to a bigger thing. There is a mighty Kingdom of which you are a very brave out-post. That minister who stands at the Altar is in the Apostolic Ministry. He links you to the Great Church of all Ages and all Lands. Can you not see, dear friends of other communions, how precious this ancient ministry is to us? You would be asking a lot of us if you asked us to give it up, or to accept some newer ministry which had its beginning a century ago, or even several centuries ago. That could never be the same to us. The link would be broken. We do not question the holiness and the good works, and the apostolic fervour of other ministries. We know that God has used them, for he is not tied to his own institutions. His Spirit blows where he lists. But that is no reason why we should not believe ourselves bound by this wonderful institution. If we were unfaithful to it, then you yourselves or your successors might in time to come blame us for our failure to appreciate our heritage which had deprived you of receiving a share in it later on. We can have a quiet little communion in a sickroom or in a lonely farmhouse or in a tiny mission church. We can have the Communion frequently. We do not have to gather a great congregation before we can realize the communion of Saints in the holy Supper. It is not the sight of many present, nor the considerable arrangements that have to be made that gives us the sense of communion with the Great Church. It is the fact that there stands at our Holy Table a minister in that unbroken apostolic ministry. Be patient with us then, for it is not for some piece of ecclesiastical snobbery that we contend, but for a vital Christian experience which depends, as all Christian experience must depend, upon a fact. Why do other bodies not desire this apostolic ministry? Why in schemes of reunion do they fight shy of ordination into this ministry? I think it is because they have managed without it, and so think it unnecessary. They have been put off by our aloofness in the Anglican communion. We have sometimes unknowingly acted in what looked like a “high hat” manner. Some of us have spoken unwisely and given a wrong impression. It has seemed to ministers of other foodies that they would be humiliated if they accepted ordination into this apostolic ministry. Quite mistakenly they thought that it would be a repudiation of what they had formerly done in the Name of the Lord. Perhaps we have given them that false impression. To many who have entered our ministry from other bodies, this ordination has been a further blessing. We all need every occasion and means of grace available to us. Anglicans must be careful so to speak and write as not to offend, lest they be a stumbling-block to good men who might otherwise in Christian charity and humility accept orders in this apostolic ministry. EPISCOPACY has been a stumbling block to some of our friends. They have never forgotten the pompous old Bishops of the dark days of the Church. It is “Prelates,” not “Bishops,” that they fear. They are probably put off by our “Lord” Bishops. There was a time when even colonial Bishops were rather inclined to be Lordly. It is one of the things we are ashamed of. Perhaps we might humble ourselves by giving up that rather meaningless title, as the Bishops of our Church in the U.S.A. have done. In the meantime let our friends of other communions be assured that it has nothing to do with the House of Lords or any claim to political power, but is nothing more than an honorary title like “His Worship the Mayor”—who is no idol to be worshipped, but only a worthy man; or “His Honour the Judge.” “Lord” is the translation of “Dominus,” which means “Sir.” We could well manage without it. It has been and is the intention, of the Church of England to continue the Ancient Apostolic Ministry unbroken. It is easy to see how much this, must mean to us, Men would ask us to give up too much, if they insisted on some other ministry for a united Christendom. The ancient Churches of the East all retain this Ministry, and have always done so. Far more Christians live under this Ministry of Episcopacy than under any other form. What is more, our ministry in the Church of England is not like something that you will find in the New Testament. It is the same Ministry There has never been any break. The earliest ministers of the Church received from the Apostles all that Jesus had received from his Father. He sent then out with all the fullness of that ministry. This they handed on by a solemn commission and ordination with prayer and the laying on of hands to the first ministers of the Church. These in turn, handed them on by ordination to the first Bishops. Some, but not all of the functions were given to the presbyters and to the Deacons to be the helpers of the chief ministers. Only the chief ministers ever ordained. That has been so universal that any seeming exceptions are too few and far between to weigh against the great stream of unbroken practice. The Bishops have handed on the commission generation after generation by solemn ordination. At our Reformation this Episcopal Succession was carefully retained, and has come down to our Bishops. That is a great heritage. It is not a matter for pride but for humble thankfulness. Our Ministry is not a copy of the past. It is the old Ministry, and it still retains the same evangelical and apostolical pattern. Those who belong to non-episcopal communions may well envy us the Bishop’s office. The Bishop is a pastor to the pastors. The pastor needs a pastor himself. Jesus knew that, and provided accordingly. He was the Pastor of the Apostles. The Apostles were the pastors of the pastors. The Bishops were pastors to the Presbyters. A local pastor may often be able to go to a layman and tell him something for the good of his soul. If another layman went to him he would resent it, and refuse to receive admonition or rebuke. But he is more likely to take it from his pastor just because he is of a different Order to himself. A local pastor sometimes needs an admonition or a warning or even a rebuke. A fellow pastor may not be welcomed to give that rebuke. The man’s pride makes it hard for him to listen to his brother. The Bishop, just because he belongs to a different Order, can give that warning, or rebuke, and the man can more easily take it. I could quote many instances of proud men who would never have (brooked interference from a brother priest who took the kindly rebuke of their Father in God, the Bishop. Jesus knew it would be like that, and provided accordingly. Then there is many a time when a local pastor is in trouble. How can he tell his troubles to a board? A board, like a corporation, has no soul. It is well known that a committee will do and say things that no one member of that committee would do or say. A board can be very hard. You can tell your troubles to another man. Even if you don’t care much for him personally, at least he is a human being able to be touched with a feeling for your infirmities. His holy office, and the grace of his ordination, also make the Bishop careful, and able to listen and to try to do something about it. A board can wash its hands of the whole matter, and no one member of the board feels personally responsible for the unkindness or indifference. The Bishop cannot wash his hands of it all so easily. He must try to do something to help. Why not look at the roots of the non-episcopal ministries? Whence come they? John Wesley said “I will ordain.” Was that enough? He was sorely tempted by the apathy of the Church, but can an individual minister ordain like that, just because he personally thinks the Church is neglecting her people? What of the ministry that stems from that individual action? Ought it not to be grafted again into the old stock? What of the Presbyterian ministry? Is it the same ministry as that of the old Church of Scotland, the Church of Columba and Margaret, planted there by the successors of the Apostles? Episcopacy need not be the rule of a single Bishop. There have been places where a group of Bishops ministered jointly as an Episcopal College. There have (been times when the Bishops left administration of affairs to the priests and laity, and confined their attention to spiritual work—teaching, preaching, ordaining and confirming. Episcopacy is not so much a system of government as a means of grace. The Church could leave administration in the hands of presbyteries and conferences, and reserve to the Bishops purely spiritual ministrations, as Pastors to the pastors, ministers of Holy Orders and Conformation, and guardians of the Faith. Was it the intention to continue a ministry already there, or was it the intention to set up a new ministry like that pictured in the New Testament, although not identical or continuous with it? We ask these questions, not to be unkind, or to discredit the labours and ministry of good men who have been used of God to shepherd his scattered sheep, and to bring multitudes of immortal souls to him; but only to ask whether, now that circumstances have altered, this ministry should not be grafted again into the old stock. Some have been put off from the Episcopal system by supposing that it was undemocratic. Whatever abuses may have grown up in England and Ireland with suppression of the Convocations of the Church have long ago been remedied. In the new lands such as Canada and the U.S.A. we have always had a constitutional Episcopacy. In England today long steps have been taken in this direction, and in Ireland and Scotland and Wales the system is constitutional, and every order of the Church is safeguarded. The Bishop is no autocrat. He is hedged about with all sorts of checks. The Church of England in Canada gives a fair picture of constitutional episcopacy as it is known today in the Anglican Communion. Each parish and mission is governed locally by the Minister and vestry. The Churchwardens represent the vestry when it is not in session, and they have their special functions. The Minister has his. The Bishop is the chief Pastor of a district called a Diocese. He presides at the Diocesan Synod that is held at regular intervals. This Synod consists of three Orders: The Bishop, who is the first Order, the Clergy, who are the second Order, and the representatives of the laity, chosen by the local vestries, who are the third Order. Each Order has a veto on the others if a motion to vote by Orders is called for. Usually all vote together, but in a matter of controversy a vote by Orders can be called for, and a majority in each Order is then necessary to pass the legislation. Adjacent Dioceses are grouped into Provinces. A Provincial Synod is held from time to time. Here too there are three Orders who usually work together but can vote separately if desired—Bishops, Clergy and Laity. The General Synod consists of all the Bishops of the whole Church in Canada who sit as an Upper House, and a Lower House of elected Clergy and lay delegates from the different Dioceses. This is the chief governing body of the Church. Here again the three Orders can vote together or separately, so that each Order has a veto on the others. From this it can be seen that there is nothing autocratic about Episcopacy properly constituted. Episcopacy has commended itself to the majority of Christians. The great Roman Church retains it, although the encroachment of the Pope upon the right of local Bishops has disfigured their Episcopacy. The old Eastern Churches have always had Episcopacy. The Church of Sweden has retained it with the old succession of Bishops. The other Scandinavian Churches have kept the form, but have lost the succession. Finland and Esthonia have restored the succession in recent years from Sweden and England. The little Moravian Church, the oldest Protestant body in the world, has kept the three Orders of Bishop, Presbyter and Deacon. Some think it has the ancient succession, although its checkered history makes it impossible now to be sure of that in the U.S.A. the great Methodist Church adopted the Episcopate. Unfortunately they were not able or did not wish to obtain the old succession. The forms of consecration and ordination which they use are so close to our own, as are all their other forms, that perhaps some day this great ministry may be grafted in again to the same stock as that of its founder. The only rival system that is worked consistently is the Presbyterian. The excellent features of this system as for instance the Kirk Session and the Presbytery could readily be united with Episcopacy. Congregational polity has never worked for long. The isolated congregations have had to seek for some larger unity, with the result that they are no longer completely independent locally. THERE are one or two outward things that the Anglican Communion considers important. This seems strange to our brethren of other names. They think that we, are making much ado about nothing. We cannot accept certain practices in connection with Holy Communion. For instance, in some religious bodies, laymen are allowed to consecrate the elements for Holy Communion. Why do we object to this? Why also do we object to our people receiving Communion from others than priests of their own Church? To us the Lord Jesus is very real. We are obliged to take him very seriously. We cannot accept the position that he made mistakes or was ignorant of certain things so that he planned unwisely. We believe that it was not without reason that he gathered the Twelve and the Twelve only for the institution of the Eucharist. We believe that the Twelve were the first Ministers of his Church, and the fact that he gave that holy tradition and command to them, not even calling his Mother to share it, is evidence to us that the Eucharist is in the special charge of the Ministers of the Church. When later on he called St. Paul to be an additional Apostle he made a special revelation to him of the Eucharist. “I have received of the Lord that which also I delivered unto you.” It is all part of the givenness of the Gospel. Our religion is all from above, not from below. If the Eucharist had been merely a love-feast to express the fellowship of all believers, then any believer might preside. But it is not Our Supper. It is the Lord’s Supper. It is a gift from him, and we believe that his special representative ought to preside at his Table. We allow only those specially commissioned from him in that old Apostolic Ministry to consecrate the gifts and preside at the Holy Table. If the Communion were merely a sort of object lesson by which we stirred up our love to God, then anyone could celebrate it. But the Eucharist is a gift from above. There is we believe an objective gift there to be received under the forms of Bread and Wine. The gift is the Body and Blood of the Lord, which are given after a heavenly and spiritual manner. This we believe requires one commissioned from above as consecrator. Then again the Eucharist is the Church’s own offering of herself to the Father in union with Christ. We are the Body of Christ which is offered. One commissioned to represent that Body must express that offering to the Father through Jesus Christ. If Laymen celebrated we should soon lose that sense of givenness, and that sense of offering ourselves. As Jesus gave that command first of all to the Apostles, “Do this in remembrance of me,” and only through them to us, we must stick out for Jesus’ way. It must be the right way. When he fed the multitudes it was the Twelve who distributed the broken bread to the people. That is why we are so p-articular about who celebrates the Communion for our people. We must follow our Lord closely, and not seem in any way to try to improve on his methods. For the same reason we cannot accept women as priests. Jesus called no woman, not even his Mother or Mary Magdelene, to be Apostles. Priestesses were well known in the world of that day, and women figure largely in the Gospel and early Church; but no woman was ordained to preach or minister the sacraments. We think our Lord knew best about this. We prefer to follow his lead. That brings us to the matter of the use of real wine and of the single Communion Cup. Why make so much to do about the outward elements? If wine cannot be had, or bread, or if wine is found to be a bad thing, why not use other elements such as grape-juice, which has been treated so as to prevent its becoming wine? With our knowledge of germs why use a single cup—why not use a number of little individual cups? Our reason for objecting to changing the elements and to giving up the single Cup are the same. To us the Gospel is Jesus himself. Our religion is founded on facts, not on bright ideas. We are saved because Jesus actually was born and actually lived and died, and actually rose again. Everything that keeps us in touch with those facts is very valuable. He used a single Cup. “Likewise after supper he took the cup.” That Loving Cup used in common means much to us. It links us with Jesus. What about germs? The Doctors tell us that the precious metals, such as gold and silver, have in themselves a germicidal activity. Jesus probably used a cup of precious metal, He celebrated in the house of wealthy friends. The Passover Cup of such a home was at least a silver one. Doctors also tell us that the alcohol in the wine is germicidal. But germs or no germs (and you have already enough of them in your body to kill you if your vitality gets low enough) we prefer to be wrong with our Lord Jesus than right with the germfaddists. Any seeming criticism of his methods in an important matter, like communion is very displeasing to us. For the same reason we must use real wine, not syrup. This is more important than the matter of individual communion cups. The refusal to use real wine can only spring from the idea that all wine is evil. Yet our Lord turned water into wine, and that apparently in large quantities, so that people might go on enjoying wine at a feast. He certainly used real wine, the fermented juice of the grape, at the Communion, and so must we. To us it is presumption to seem to know better than our Lord Jesus what is right or wrong. Nor can we admit the false opinion that goodness or badness resides in material things in themselves. It is in the use of them that the goodness or badness resides. We cannot but feel that the ultra-puritan attitude to wine has led to more evil than good. We object to the Roman practice of denying the Cup to the laity on the grounds of reverence, lest there be an accident with the Cup. That seems to us like trying to teach our Lord Jesus reverence. So we object to grape-juice in place of wine as seeming to try to teach him temperance. Perhaps the widest gap that divides us from our brethren in the Roman and in the Protestant Churches is one of morals and ethics. The legalism of some of the Roman moral theology, and their laxity about annulling marriages is a real obstacle to union with them. The legalism of Protestant ethics is just as difficult for us to reconcile with the teaching of our Lord. On the subject of Sunday observance, and on the subject of prohibition, and on the subject of the use of cards, dancing and tobacco, I fear we are in fundamental disagreement with our Protestant brethren. The reason for our disagreement is that to us they seem to have gone behind Christ to the old system of the Law. They seem to us to have gone back to tithing mint and annise and cummin and to have forgotten the weightier matters. They seem to be trying to legislate people good instead of persuading them to be good for love of God. Why is one action good and another bad? It all depends on our knowledge of God. God is true, God’s just, and God is loving. Actions or words or thoughts that are not true are contrary to God’s nature and therefore wrong. Actions and words and thoughts that are not just and fair are contrary to God’s nature and therefore displeasing to him. Actions and words and thoughts that are not loving are contrary to the very nature of God and are therefore immoral. It is not things that are evil, but thoughts and words and deeds. Tobacco and wine are not evil in themselves, for God made them and he saw all that he had made and it was very good. These things can be misused, as can any good gift. THERE are three restorations badly needed in this upset world. We need to recover true community. We need to recover a sense of vocation by God. We need to recover the sense of the duty of sacrifice. All of these could be best recovered in a united Christendom. If we were united in Christ, the Church could be the natural focus for unity in each community. It could be the centre of all philanthropic work, for all social service, which would then become Christian service. Such a Church could teach the dignity of vocation. Every man and woman and child could be taught that he is a priest in his own craft or business, offering up to God on behalf of the community all the work he has been able to do, working not just for a pay envelope, but for the love of God and his fellows. The House of God in such a community could become the centre of all the work and worship of the community. It would be the most beautiful and the most used building in the District. To it all would turn in joy or sorrow, in hope or fear. It would be decorated outwardly with the handicraft and wealth of the district, and inwardly by the beauty of the holiness of the worshippers and the many-colored graces of their lives and devotions. Would such a wonderful Consummation be arrived at more quickly if the Church of England abandoned her distinctive worship and her ancient Orders? It does not seem likely, for her “setup” is well fitted to provide the sense of community, if some of the fervour of the Evangelicals could be injected into it. She has also the form that will best link up the local community with the larger community beyond its borders. She also with her liturgical and God-centred worship can provide the outward means of sanctifying the personal vocations, and of offering up the sacrifices of the daily lives of the members of the community. Hers is an ideal not a weekly worship but a daily, and it provides opportunity for dedicating to God much of community life in a worthy and beautiful form. But the Church of England as she is will not be able to do it. She has much to offer, but the great evangelical bodies have their contribution to make, and so have the Churches of the East, and a reformed Roman Communion. God help us to find a way to unity, and through unity to true Christian community and the Kingdom of God on earth.